In this installment of “Ten Years a CCIE,” I look at what you have to do to stay certified, and the difficulty of maintaining your credential. Passing your CCIE gives you a great feeling of accomplishment, and also a sense of relief. You’ve spent months studying and late nights configuring scenarios in the lab. Maybe you took the exam multiple times, and had to experience the letdown of knowing that, instead of being finished, you had more months of studying ahead. So, you’ve finally passed, and it’s all over, right? No, unfortunately. You have a CCIE, but if you want to keep it, you have to worry about hitting the books again every two years. 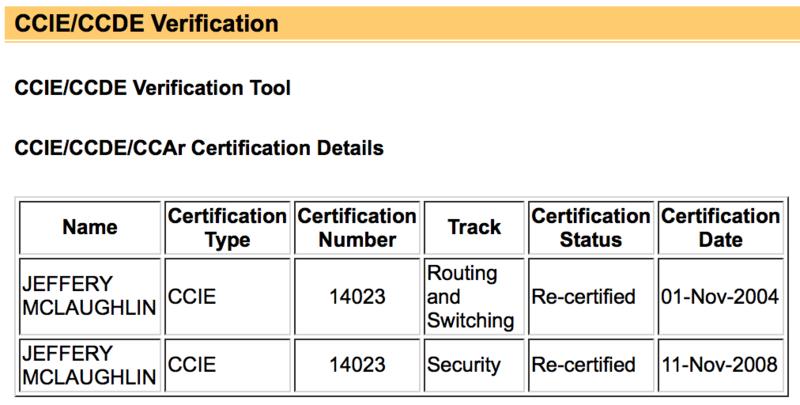 All CCIE’s have to re-certify, a biennial ritual that becomes harder as the years go by. Here’s how it works. Before two years after your lab date, you have to re-certify your CCIE by passing a CCIE written exam. You can take any written exam, just as long as it is a CCIE written. For example, if you passed Routing and Switching, you could recertify by taking the Data Center written exam. This has the advantage of simultaneously qualifying you for another lab exam, if you are so inclined. If you have more than one CCIE, you can recertify all of them by taking any CCIE written. For example, if you have Routing/Switching, ISP Dial, and Collaboration CCIEs, you could recertify all of them at once by taking the Wireless written. This holds true even though ISP Dial is no longer a valid certification. Even if you only have a certification that no longer exists (such as ISP Dial or SNA IP), you can maintain active CCIE status by passing any written exam. If you don’t pass a written exam, at the two year mark your certification becomes suspended. You can no longer use your CCIE number in your signature or claim to be a CCIE. You can still pass the recert exam within a year, but if a year elapses after you go suspended, you lose your CCIEs, all of them, and have to retake both written and lab for any CCIE you hold. Needless to say, you don’t want that to happen. If you just passed your lab exam and you feel super-confident, you may think you don’t have to worry about a measly written exam in two years. However, any CCIE will tell you the recertification ritual is onerous and a huge waste of time. 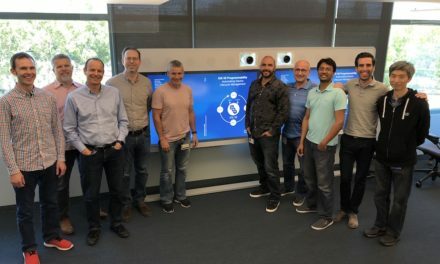 As your career advances, you will often find yourself doing less and less CLI, and you might in fact work less with Cisco products. In my case, re-certifying became especially painful during my six years at Juniper. It would be less of a burden if the exams were better written. The last time I took the written, there was a question that was flat out wrong, and many that were just obscure. When is the MSDP ConnectRetry timer used? a. When the MSDP peer with the highest IP address transitions from the INACTIVE to the CONNECTING state. b. When the MSDP peer with the lowest IP address transitions from the CONNECTING to the ESTABLISHED state. c. When the MSDP peer with the lowest IP address transitions from the INACTIVE to CONNECTING state. d. When the MSDP peer with the highest IP address transitions from the CONNECTING to the ESTABLISHED state. What is the RSVP message type for a PathTear message? What does the “ipv6 mld limit 100″ command do? c. Limits the number of MLD states to 100 on a per-interface basis. d. Limits the number of MLD states to 100 globally. At the time I wrote them, these questions were technically within the blueprint topics for the Routing and Switching written exam, but they are obviously rather stupid questions. The R&S blueprint is so huge that it is essentially impossible to know all of the subjects it covers. Nevertheless, I was encountering questions of roughly this level of obscurity on the exam. Why do we have to recertify? Obviously, the main reason is to ensure CCIE’s stay current in the field. I passed routing/switching back in 2004, and a lot has changed in 12 years. It’s important that people who come to me for expertise believe that I actually have relevant knowledge. We have to ask a question though: how well do you stay up-to-date taking a written exam every two years? And why can you keep your credential when you re-certified in a different track? 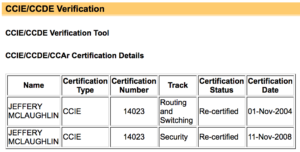 For example, if someone acquired a CCIE Security certification back in 2002, but re-certified for 14 years using the routing/switching written, why is that engineer qualified to continue calling himself a “CCIE Security”? He probably knows nothing of modern security technologies. Juniper requires JCNIE’s to recertify in each track they have certified, so a triple JNCIE has to take three separate exams. While this is painful (and kept me to one JNCIE), it makes more sense. I think an even more reasonable approach is to allow continuing education in lieu of a test. This is the requirement for CISSPs, lawyers, and even doctors, and it makes a lot of sense. I never remember much from the recert exams, but a couple days of training would be a great way to get current. I do think Cisco was smart to introduce the Emeritus option. CCIE Emeritus allows CCIE’s who have hit the 10 year mark to pay a fee to keep their number in a non-active status indefinitely, with the option to recertify. Many CCIEs reach a point where they don’t deal with day-to-day CLI configuration, and find the exams harder and less relevant to their careers. Several of my friends have chosen this option. I almost did when I worked at Juniper, but I am thankfully still current. By the way, the answer to all of the above questions is ‘C’. In my next article, Cheaters, I look at the question of whether people cheat on the CCIE exam, and the effect it has on the value of the certification.